If students can learn how to memorize multiplication tables, they will be on their road to becoming successful math students! All they need is a little boost of confidence to get the ball rolling! 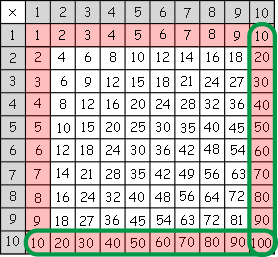 We're going to focus on multiplication tables up to 10 x 10 on this page. 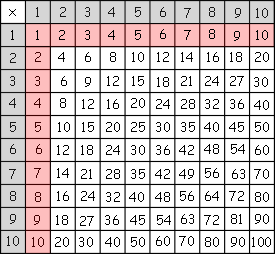 For starters, go ahead and print the multiplication table chart. If you're working with a class or more than one student, you may want to print one off for each student. Memorizing the time tables isn't as bad as it might first seem. I'm going to show you a series of multiplication table charts and color all of the multiplication facts that you probably already have memorized. And if not, we'll teach you how easy those multiplication facts are! 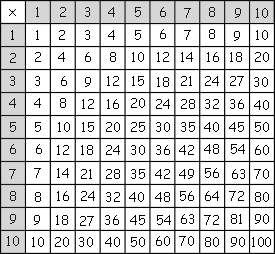 In each of the multiplication table charts pictured below, I you will see I have shaded some of the numbers. The numbers shaded are the tables that are very easy to memorize! 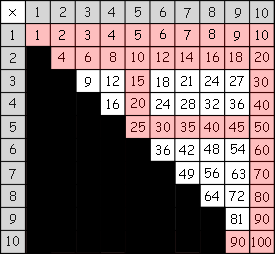 The last multiplication chart pictured will have most of the numbers shaded. The ones not shaded are the multiplication tables that most students need to memorize! This first tip is probably the easiest tip of all and is one every student should know. When you multiply any number by 1, you just get the number itself. So notice we have shaded all of the numbers being multiplied by 1 in red. Another easy tip every student should know. When multiplying any number by 10, just add a zero to get the product. In the chart below, you'll notice all of the 10 facts have been shaded in red with a green and circled in green. The twos are really easy as long as you know how to "count by twos". And most of us know how to do that. 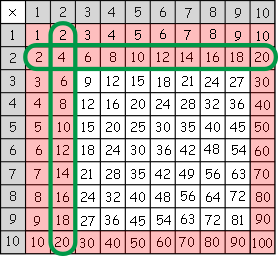 The two multiplication facts are circled in green below. Multiplying a number by 5 is super easy! All you have to know is how to count by fives! You can see these are the numbers shaded in blue. 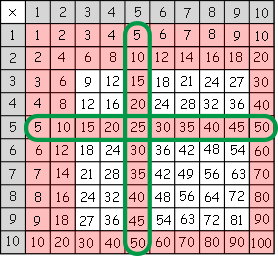 You'll notice below I've circled the five-multiplication facts in green. Almost half of the table are duplicates. For example 6 x 4 = 24. But you will see this multiplication fact in the table again as 4 x 6 = 24. In the picture below I've shaded all of the duplicates in black. So the only multiplication fact products that are left are the numbers in white! So these should not be that hard for students to memorize. Hands-On Way to Multiply Big Numbers! Fraction Made Multiplication with Rectangles!